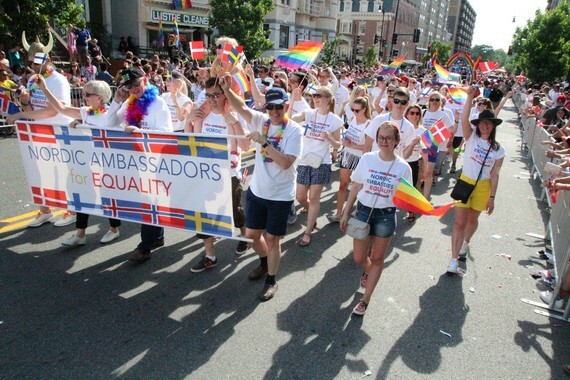 Before joining the Capital Pride Parade on June 11, I published a post on my blog "The-Y-inDiplomacy" about why it's important to wave the rainbow flag in support of dignity and equality for the LGBTI community. The parade turned out to be fantastic experience, a joyful and fun fiesta. A few hours later, dozens of innocent people fell victim to a cold-blooded, calculating terrorist with a completely different agenda - to attack values of equality with the aid of a semi-automatic rifle. The unimaginable horrors that took place inside the Pulse nightclub in Orlando in the early hours of June 12 have sent a shockwave through the world. Expressions of sympathy and condolences have since been flooding in from everywhere, including from Norway's King Harald V and the Norwegian Parliament, who have addressed President Obama and the U.S. Congress, respectively. Yet, while mourning and condemning this homophobic hate crime, I see what happened as a reminder that the vision of equal rights for everyone - regardless of ethnicity, religion, gender or sexual orientation - is still exactly that: a mere vision. Millions of people are suffering every day from oppression, whether psychological, cultural, or in the form of physical violence and persecution. That is "Y" it is so important for me to continue to show my support. And that is "Y" it is important for my government to continue to work for these rights in all relevant international arenas. Complacency toward homophobia, regardless of cultural pretext, will not be tolerated. Human rights, as defined by relevant international conventions, are universal. They must therefore be applied universally. Both as an ambassador and as a private citizen I feel an obligation to defend the LGBTI community and equality as a human right. I will proudly carry the "Nordic Ambassadors for Equality" banner again in next year's Capital Pride Parade.